Cafe Britt, online at cafebritt.com, grows, roasts, and ships the finest gourmet coffees. Cafe Britt embraces fair trade practices and offers fine coffees from Costa Rica, Mexico, and Peru. Cafe Britt offers a variety of roasts for daily drinking and special occasions. CafeBritt.com also offers gourmet treats, including chocolates, gourmet hot cocoas, candies, sweets, cookies, and more. Cafe Britt is a great destination for gourmet gifts for coffee lovers and friends. But before you shop, get all the latest cafebritt.com discounts, Cafe Britt promotions, and Cafe Britt coupon codes found here at RetailSteal.com. 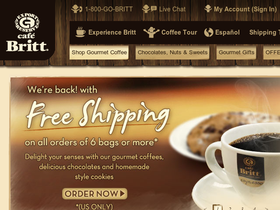 Cafe Britt ships within the United States, Canada, and international destinations. Some restrictions may apply. See site for more information. Enjoy a $10 discount from Cafe Britt. Use coupon code on your purchase of 8 or more bags. Get free shipping from Cafe Britt when you purchase 6 or more bags. Offer valid for deliveries within the Continental United States and Canada. Click here to shop. Save $10 on coffee at Cafe Britt with your purchase of 8 or more bags. Click to shop and use coupon code to save. Save $1.95 on each bag when you purchase the 20 Gourmet Coffee Special right now at Cafe Britt. Click here to shop and save. Enjoy free shipping on select gourmet products from Cafe Britt. Click link to shop and save. Shop for delicious gourmet chocolates and sweets for only $6.95 from Cafe Britt. Shop today and save. Get 20 bags of freshly roasted gourmet coffee for the low price of $160 from Cafe Britt. Plus enjoy free shipping. Click to shop and save. Shop for freshly roasted gourmet coffee, starting from only $7.45 per bag from Cafe Britt. Click to shop. Shop the latest seasonal specials right now at Cafe Britt. Click link to shop and save. Enjoy a 10% discount on purchases of six items or more when you enter our coupon code at checkout at Cafe Britt online today. Use our coupon code at Cafe Britt online today to save $40 on purchases and enjoy free shipping. Click our link to shop today. Shop at Cafe Britt and enjoy $20 savings on Britt Gourmet Fine Coffees $40+. Click here for code.